The first thing you notice, arriving at the Chicago Police Training Academy, is that it’s teeming with cadets. The Near West Side facility is the busiest it’s been in awhile, with the police department ramping up efforts to hire 1,000 new officers. Cadets in the halls walk in formation and politely greet every person in chorus. Rookie training lectures are loud enough to hear as you pass open classrooms. But inside this classroom, the door is closed. The term refers to the way police interact with the public; how those interactions shape the public’s view of police and their view of the legitimacy of police authority; and then how that shapes the public’s willingness to obey the law. 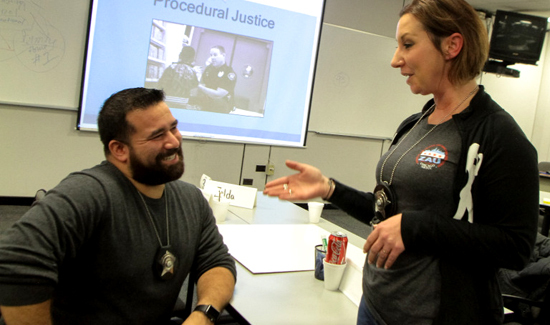 As evidence mounts that the community’s perception can significantly impact public safety, procedural justice has become a buzz term in policing. There are no rookies in this classroom, all veteran officers. Today, a few everyday citizens and a couple of reporters, including me, join them. Against the backdrop of a U.S. Department of Justice report finding a pattern of racially discriminatory conduct, excessive force, deficient training and lax punishment of cops, the police department is trying to showcase an aspect of police training it says it’s doing well. The scathing 161-page report describes Chicago Police rookie training as grossly outdated and poorly taught, but the Justice Department’s National Initiative for Building Community Trust has promoted CPD’s procedural-justice curriculum as a national model. Some 11,294 Chicago cops have taken the course since the department began offering it in 2012. That’s virtually the entire police force.